Punishing games have made a big comeback in the mainstream gaming scene. Games like Dark Souls and Super Meat Boy have become big hits due to their insanely challenging, but fair, gameplay mechanics. The War of the Worlds tries to reach back to the time where Prince of Persia and Out of This World were premier platformers and scrape the barrel for people's nostalgia for old-school challenges. However, game design has come a long way since those titles were introduced, and it feels like The War of the Worlds forgot that. It's a game that, while beautiful in both sound and graphics, suffers from many gameplay problems that would make Lester Knight Chaykin cry. The War of the Worlds sets players in the role of an Englishman, voice by the great Patrick Stewart, during an invasion of Earth. Obviously the game borrows heavily from the universe created by H.G. Wells but it doesn't follow the story completely. Instead players follow the protagonist through various parts of England as he traverses the landscape and outruns the murderous martians. On a mission to save his family the protagonist sets off on an adventure of bad platforming and frustrating encounters. The War of the Worlds does not control well, it's as plain as that. The controls are simple enough, you move with the analog stick or d-pad, A to jump, and X to run and use items. With such a straightforward layout it's a shame that the game manages to muck up the platforming through the many platforming problems. Running in the game feels sticky, meaning that the character continues for a step or two after you're done pressing forward. It feels a lot like the original Prince of Persia but not in a good way, more in a way that leads to uncountable frustrating situations where you can't line up a jump properly because the character won't just stand in the right spot. Platforming is the main part of The War of the Worlds, and the odd trial and error jumps don't do much to make the experience feel great. There are some jumps that feel perfect, you run and press A and the character gets to where he should be. Other times, however, a jump will either miss a platform completely or just barely reach the edge which leads to a very long pick up animation. Worse still is when a jump misses a platform and the character falls. 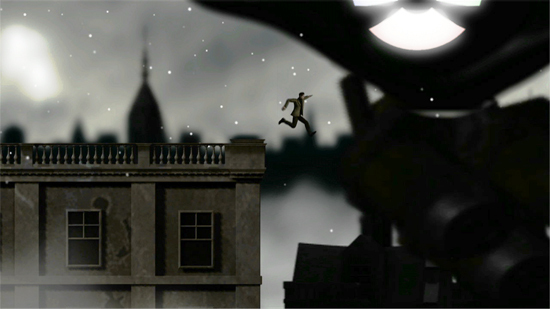 The distance the character can fall seems extremely short, even a small tumble will cause the main character to die and that will lead players to experience the problematic checkpoint system. Checkpoints are hit or miss in The War of the Worlds. Some checkpoints seem fair enough and start you at points that both make sense and feel helpful. Other times you'll die 10 minutes into a very difficult platforming sequence only to start an additional five minutes before that sequence takes place. It can be infuriating when instead of moving on you're stuck dying over and over and when you finally move on and die again you have to start back at the choke point. Dying becomes inevitable in The War of the Worlds because enemies are borderline immortal and the platforming works against the player in every way. There's an achievement on the XBLA version for beating the game without dying and personally I don't see how that is possible. The problems with the platforming also do a lot to take away from what could be the more memorable moments of the game. Having to replay a sequence that should be emotional and touching over and over makes the moment lose all of its luster. Running with hundreds of screaming people as a tripod snatches and vaporizes them all around you should be intense. But after running from the tripod 50 times because the platforming stops you from continuing forward you forget what's going on and just power through the level. The War of the Worlds tries to switch up the gameplay with the occasional switch puzzle, exciting run sequence, and some basic melee combat but it does little to ramp up the experience. Overall the gameplay is so frustrating that it takes away from the experience. In games that focus on difficult gameplay the player should feel that they aren't playing "good enough" if they die not that the game is deliberately screwing them over with no give at all. The War of the Worlds is a strange case when it comes to graphics, much like its gameplay the graphics are very hit or miss. While the backgrounds are typically gorgeous and evoke a very Limbo aesthetic the character models seem very bland and typically animate awkwardly. The main character doesn't look too sharp and his animations are typically very awkward, especially when there's a lot going on. In some sequences he would get caught up on ladders or would roll and instead of catching a ledge he'd awkwardly miss it and fall. Another problem with the graphics is the amount of things going on at one time. When you're running from a killer martian tripod that is vaporizing everything in its path you don't want to have characters in the foreground blocking your view. Often times the game goes for a neat effect where the background, main plane, and foreground are all active. This means that stuff is going on in the background, stuff is going on your plane of play, and stuff is going on in front of your plane of play. 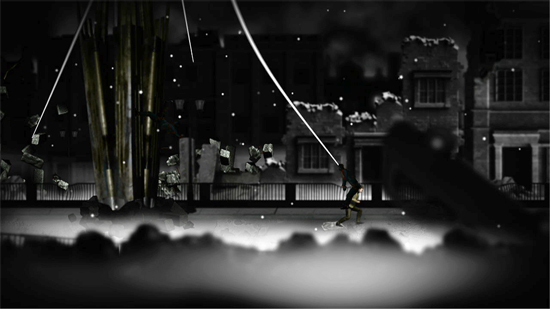 This typically means that characters and tanks walk and run in front of the character and the field of view, leaving the player blind as to where they are in the world. This can lead to serious problems when your location on a map can mean safety or death. 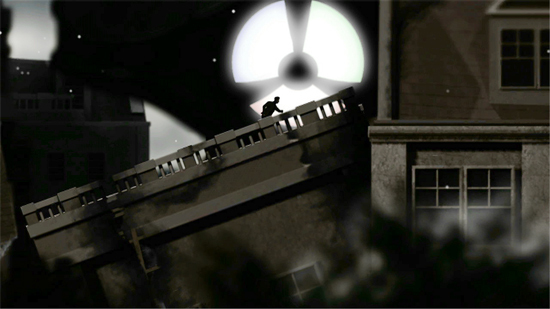 The game is also very dark at times, despite adjusting the gamma, and that too leads to problems with viability, a problem that just shouldn't exist in a fast paced platformer. Perhaps the best part of the game, and the only solid portion of the game as a whole, is the audio. Patrick Stewart does a great job of narrating the story and lends a truly professional feel to the whole experience, as always. The music evokes the feel of the world greatly and does a good job in making parts feel intense, sad, or just unbelievable. Sound effects also sound fantastic as martian robots sound either creepy and robotic or monstrous and menacing depending on their scale. Sadly the sound design can't do much to make up for the lackluster problems The War of the Worlds exudes. While parts of it look great and all of it sounds fantastic The War of the Worlds is just impossible to recommend to anyone. Even with the talent of Patrick Stewart the game is just not playable in a way that would make for a fun and enticing experience. While it tries to borrow heavily from platformers of the past The War of the Worlds fails to rejuvenate its gameplay enough to make it feel fresh and playable. Those games were great when they came out, but game design has evolved so much over the years that playing something that feels so dated and, in a way, broken is just not permissible. There are a few moments that the game feels really fun but those moments wear off very quickly once the grind kicks in. Unless Real Steel is a movie that defines you there really isn't any reason to go whole hog over this game. Oh, it doesn't have Hugh Jackman in it in case you were wondering.